This is a fascinating PDF that should be in every magician’s reference library. This contains new material never revealed before by Devin Knight. Imagine that you can create effects so impossible, that the only solution that an audience could have is that the person is a stooge. Imagine, that you point out to an audience, that the effect you are about to try appears so impossible, that you will take some measures to ensure that the people who come on stage are completely at random, not stooges or confederates and beyond your control. Yet, meeting these conditions, the people who come on stage in the fairest random selection procedures are in fact one or two stooges. You go out of your way to prove that the people coming on stage are not confederates through random selection procedures, yet they are. These are what I call Undetectable Stooges . These are some of the most advanced techniques ever released to the fraternity and the methods will even fool magicians not familiar with these techniques. Two different methods, created by Devin Knight that are completely different from each other are revealed. Imagine having three people come on stage, who are selected at random through a process that would make it impossible for anyone prearranged to come on stage. In fact, the first person chosen at random then selects the other two people who come forth in a random way he can’t control. Under these conditions the first person names any one of the four suits in a deck of cards. The second person names any card value and the third person names a number from 1 to 52. Say they formed the card, Six of Clubs, and the third person names a number. Without the magician touching the deck, a spectator counts down to the named number and at that point in the deck is the freely formed card. To an audience, this effect is staggering. It only involves one stooge, not three, and his presence is undetectable. Using these techniques, you can perform unexplainable effects that could not otherwise be done under these conditions, yet have no fear that anyone will realize you have a stooge on stage, as such a thing appears impossible the way the person was selected at random. 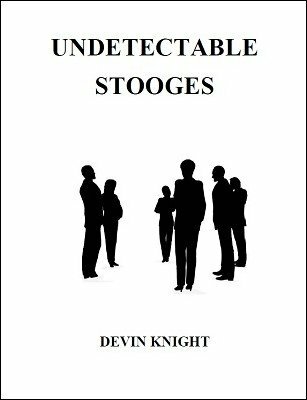 Even if you feel you will never use a stooge, this ebook is worth reading to increase your magic knowledge and to know when another performer has rung a stooge on stage unbeknownst to the audience. Be in the know with this information.